The Wings Fluff Underpads from Kendall are durable and absorbent, keeping your bed dry and your skin comfortable throughout the night. The non-woven top layer and diamond-embossed bottom work together to provide gentle, reliable protection, while the highly absorbent fluff core keeps both the skin and the linen dry, making these bed pads ideal for individuals with moderate incontinence. 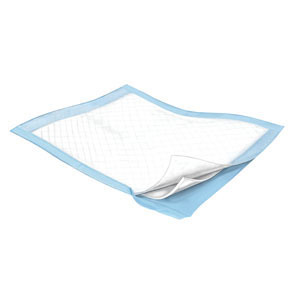 Protection Plus Underpads, 30" x 30"